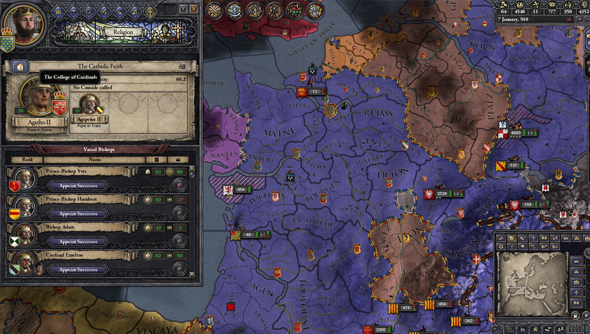 For Crusader Kings II’s fifth expansion Paradox have turned to God. Sons of Abraham brings the Christian, Jewish, and Muslim world to their vision of Medieval Europe. While the features of the new expansion are being kept under wraps you’ll be presented with unique decisions for each religion, from appointing bishops, pushing a particular agenda in the Islamic debate, and doing your bit to restore Israel. In a dev blog on the forthcoming expansion the developers have detailed something of Catholicism will work in Sons of Abraham. To become Pope yourself you’ll need to have one of your bishops elected appointed as a cardinal and then, well, get the current Pope out of his chair. The, with a little money greasing the wheels, you may be able to get your cardinal Pope-d.
Having a Pope favourable to your crown is clearly a benefit to you. “Popes that come from your realm will like you – a lot. Of course, that means they will be likely to grant your requests. Want to get divorced? No problem. Want to invade someone? Ok. […] he can give you money, plain and simple. He can also approve your candidate for a bishopric under Papal Investiture, or even declare a Crusade on the infidel of your choice. We’ll learn more about how the other religions will work in future developer blogs. We won’t have to wait long to try Sons of Abraham for ourselves. It’s due for release on 18 November.